LAMP is short for Linux, Apache, MySQL, PHP. 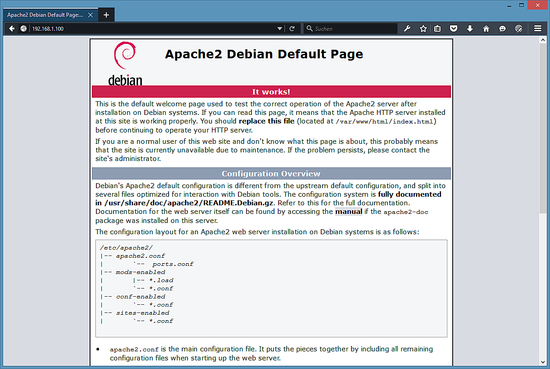 This tutorial shows how you can install an Apache2 webserver on a Debian Jessie (8) server with PHP 5 support (mod_php) and MariaDB support. MariaDB is a fork of the well known MySQL database server, it provides a MySQL compatible feature set and is a bit faster according to benchmarks that I found on the internet. 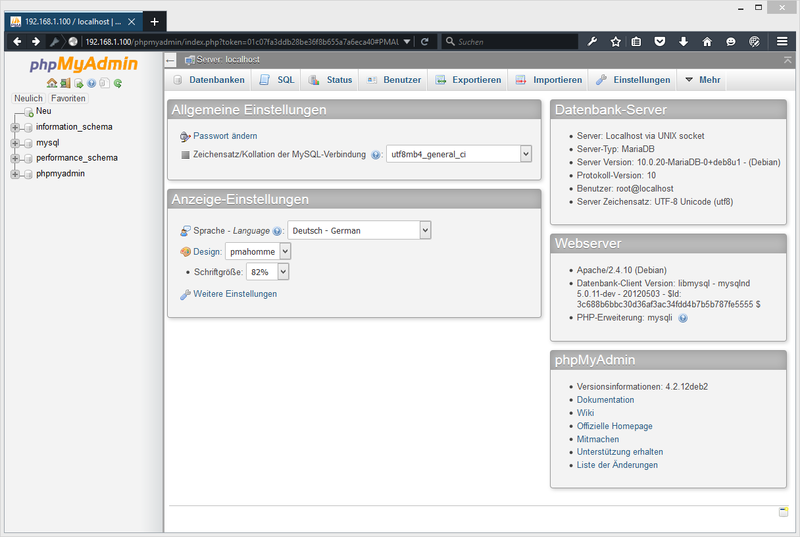 MariaDB will work with all applications that require MySQL like Wordpress, Joomla etc. As you see, PHP5 is working, and it's working through the Apache 2.0 Handler, as shown in the Server API line. If you scroll further down, you will see all modules that are already enabled in PHP5. 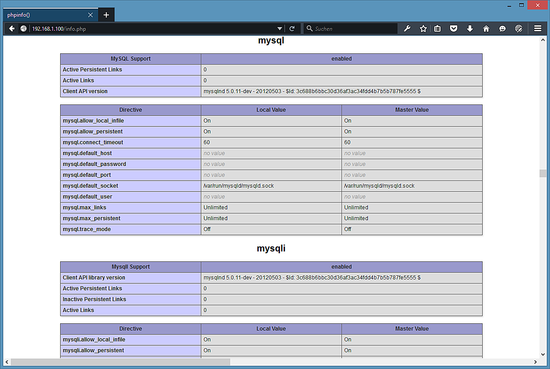 MySQL / MariaDB is not listed there which means we don't have MySQL support in PHP5 yet. PHPMyAdmin will switch to the language of your Web Browser automatically as long as there is a language file for your language. So don't worry that the screenshot is in German language, your PHPMyAdmin install will be in your native language automatically. Really a simple, clear and working explanation. Thanks a lot! It would be nice to have tutorial how to setup VSFTPD with apache2. Like secure permissions and so on. Amazingly clear and simple. Thank you very much. On a side note, I couldn't gain access to the index.html file created automatically by apache since it was located in www/ and not in www/html/ (which is the reason why I looked for a tutorial). That being said, you explained in step 5 that the root was actually www/html/ so I managed to fix that. Is there a reason why you could access to the index and I could not? Are you sure that you use Debian 8 (Jessie) and not Debian 7 (Wheezy)? 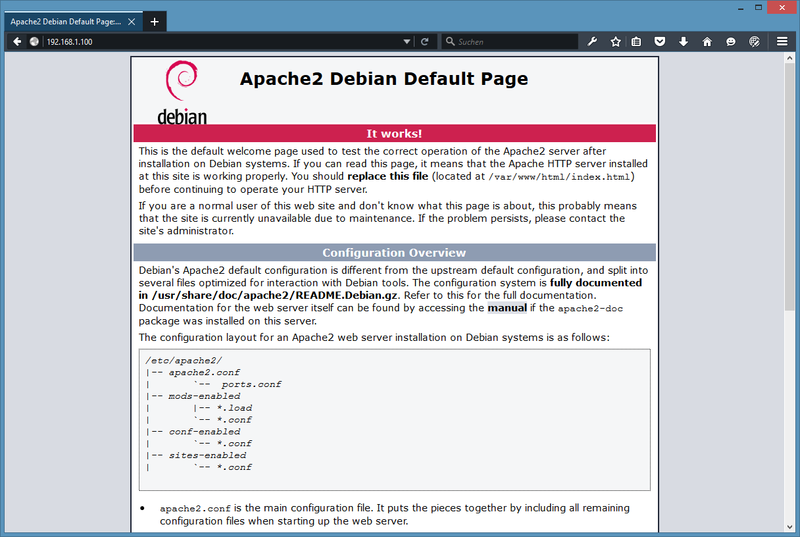 On Debian 7, the index page was in /var/www while it is /var/www/html/ on Debian 8. Yes. I am using Debian 8.1 (Jessie). Hi, I finished the tutorial then go onto http://localhost/phpmyadmin, and it says NOT FOUND ON THIS SERVER. You think its because of my wireless usb dongle messing up the IPs? because my main ip on ifconfig is 10.0.2.15? Thank you for this easy to understand and great tutorial! I have everything installed and the info.php file just shows a blank page (no error). I'm just learning linux and php, so I'm not sure if I missed something. I followed this tutorial completely. Most likely a typo in your info.php file. Take a look into the apache error log: /var/log/apache2/error.log to see the exact error message. Well I tried the cd /var/www/html/example.org/public_html sudo ln -s /usr/share/phpmyadmin for the 404 error on myphpadmin and get told no such directory exists. The script said it installed just fine, just can't find the darn thing, it is not in /var/www/html/ that's for sure. Ensure that you select the apache option in the dialog. Just tried looking at the error log and I'm getting "This location could not be displayed". Clearly I did something wrong installing Apache2. Should I remove Apache2 and try re-installing? Very, very good tuto. thank you. help me, how to fix ? Reading package lists... DoneBuilding dependency tree Reading state information... DoneSome packages could not be installed. This may mean that you haverequested an impossible situation or if you are using the unstabledistribution that some required packages have not yet been createdor been moved out of Incoming.The following information may help to resolve the situation:The following packages have unmet dependencies: mariadb-client : Depends: mariadb-client-10.0 (>= 10.0.26-0+deb8u1) but it is not going to be installed mariadb-server : Depends: mariadb-server-10.0 (>= 10.0.26-0+deb8u1) but it is not going to be installedE: Unable to correct problems, you have held broken packages. The tutorial still works fine. Your problem is that you installed your server from an install disk and then did not comment it out in the Debian sources.list file. so either insert the disk again when you install additional software or comment out the disk as install source in the sources.list file so that debian fetches the files from the internet repository. does this tutorial also applies to Debian Stretch? Debian 8 Jessie LAMP server tutorial with Apache 2, PHP 5 and MariaDB (instead of MySQL) as virtual machine image download in ova format, compatible with VMWare and Virtualbox.